We already know how to get an object from the Spring container using the getBean() method but sometimes we have the opposite need. That is, we want to use the Spring container in our object to have access to other objects in its container. Is there a way to do that? I can say, Spring supports us to do that. By implementing the ApplicationContextAware interface, our object can use the Spring container. Let’s take an example to see how it works. In this example, we have an application that manages classes. Here, perhaps, some of you will wonder why just implementing the ApplicationContextAware interface, the class object A can call the Spring container. Let me answer is that: Spring uses the following code to automatically put the Spring container into the object needed. 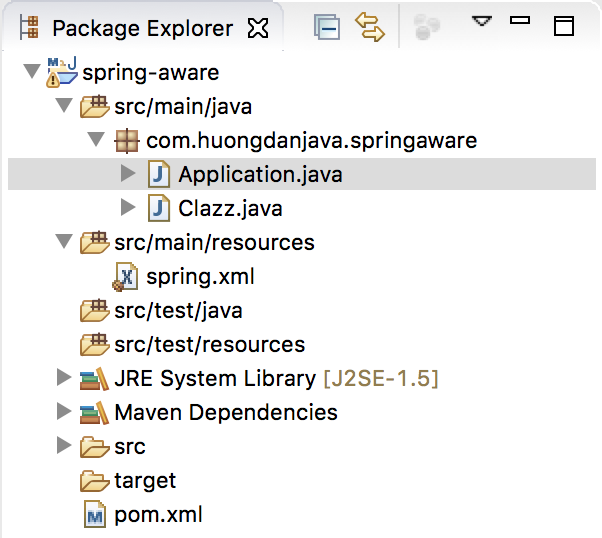 As you can see, any object that is an instance of the ApplicationContextAware interface, during the runtime, that object will be automatically assigned the Spring container, here is the ApplicationContext. Now back to our needs is to take the name of class B.